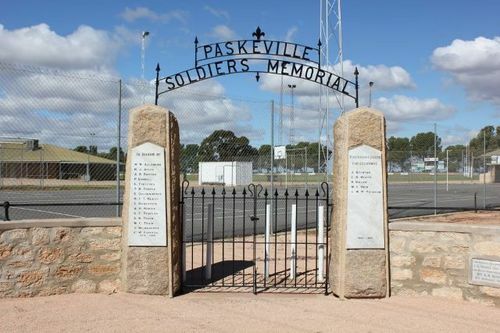 Paskeville Soldiers Memorial commemorates those who served in World War One. The opening of the the Memorial Arch and unveiling of the Memorial Tablets at the Paskeville Recreation grounds on Wednesday 26th was a thorough success, a large crowd assembling in the afternoon. Motor cars carried contingents from Kadina, Wallaroo, Kainton, Melton, and elsewhere. The school children, under Mr. Gansen (head teacher) were massed in front of the arch which is formed by two obelisks of granite, and the lettering, "Paskerville Soldiers Memorial" in ironwork. The names of the men who enlisted and those who fell in the great war are inscribed on marble tablets, and the whole forms an appropriate memorial,which gives entrance to the the recreation grounds. Chronicle (Adelaide, SA), 26 November 1921. This memorial was opened by H. G. Tossell Esq. M.P. and Roll of Honor unveiled by Mrs. A. M. Heath. 16th November 1921.